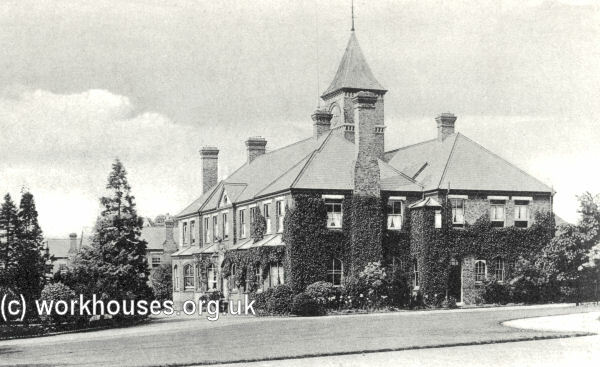 The South Metropolitan Ditsrict School, Sutton, Surrey - a residential school for workhouse children. The South Metropolitan School District was formed in 1849 to serve the Unions of Bermondsey, Camberwell, Greenwich, St Olave's, and Woolwich. Later members were St Mary, Newington (1854-1869), Stepney (from 1873) and Woolwich (from 1868). THE SOUTH METROPOLITAN INDUSTRIAL SCHOOLS AT SUTTON, SURREY. The act of Parliament under which Schools of this kind are constituted was passed some years ago, yet little progress in carrying out its provisions was made until recently — the City of London Union Schools, at Norwood, and the North Surrey Schools, at Anerley, having been the first in operation near the metropolis. 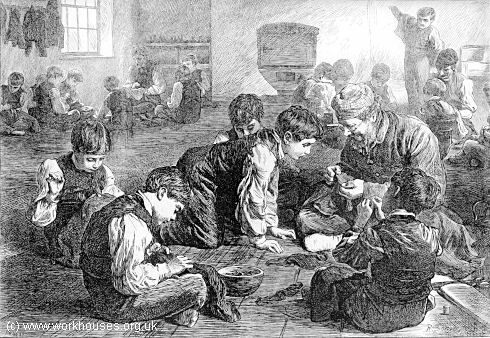 They are for the maintenance, education, and industrial training of the pauper children appertaining to any particular parish or union of parishes, in a mode whereby it is deemed that much moral, physical, and economical advantage will be obtained by bringing the children together in an out of-town locality, and under a special discipline, instead of rearing them within the confined walls of an ordinary workhouse, where the means of suitable education are limited and imperfect, and where also the demoralising influences and associations are very great. The new system embraces the occupation of several acres of land, upon which the elder boys are made to work at spade labour, and at farming and other manual operations, thereby invigorating their constitutions, and at the same time raising a considerable produce for the support of the establishment ; and the results already experienced create increased confidence in the ultimate success of the method. The Schools at Sutton are erected for a district comprising ten parishes, and are designed for the reception of 1000 children is three classes-of girls, boys, and infants ; each class being in a distinct arm of the building, and having, also, a separate playground. The apartments of the governor and matron, the committee-room, and other offices connected with the chief supervision, are in the centre. Behind the governing department, and in the middle of the whole range of buildings, is the victualling department-comprising the dining-hall (126 feet by 33 feet), the kitchen and its various offices, and store-rooms, and the bakehouse ; also a boiler- house, in which will be produced hot water and steam for cooking, warning, washing, and for working a steam-engine to pump water from the well into tanks placed over two large staircases above the level of every floor in the building. The wash-houses and laundry are near at hand on one side of the kitchen yard, and on the other side are carpenters', tailors', and shoemakers' workshops. The schools, dayrooms, and dormitories, occupy the long arms extending each way from the centre. The infirmary is a detached building in the rear. The homestead for farming, between fifty and sixty acres, has not yet been commenced ; and, moreover the extreme ends of the building have been for the present omitted. The extreme length of the building will be 580 feet, and the depth from front to back 370 feet, and its situation is upon a fine bank of elevated ground with a chalky subsoil. The architect is Mr. Edwin Nash, of London, and the design was selected in competition in 1850. South Metropolitan District School, Sutton from the east, 1850s. ABOUT two o'clock on Thursday morning, the 13th inst., the superintendent, matron, officers, and servants of this large and recently-erected establishment were alarmed with the cry of "fire". The edifice is in the Elizabethan style, and presents a magnificent appearance. It is about 200 yards long, and varies in depth from 20 to 200 feet. The central portion, forming the dining-hall, with two very large dormitories above, is the most elevated, and has at each end a high fireproof tower, containing a stone staircase, and supporting, near the summit, a vast tank of water, employed for domestic purposes, and useful in cases of fire. From each tower run wings north and south, about 140 feet long; and at the extremity of these are other wings, added within the last year, and running about 150 feet from east to west. These last-mentioned portions have only been occupied for a few months, and the officers have not enjoyed the new private apartments, which had just been comfortably furnished, more than two or three weeks. The fire was discovered in a small blanket store in the upper story of the new south wing occupied by the girls. Owing to a deficiency in the supply of water, and to the enormous quantity of fir timber employed in the construction of the building, it was impossible to arrest the progress of the flames. They leaped from beam to beam and from window to window with amazing rapidity, and the brilliant light afforded by the burning roof aided in the certain and immediate deliverance of the 900 children in the building. Not one of them suffered the least personal injury. When they first perceived their danger, their screams, or rather yells, were most fearful. The nurses and officers, who sleep in the apartments near them, were soon amidst them, silence was obtained, and they were directed down some stairs, which led them through the front apartments into the grounds. previously, the nurse of the girls' dormitory, who first discovered the fire, had rescued the sick committed to her care. Similarly 200 infants were delivered by the exertions of the nurses and servants over them. Too much praise cannot be awarded to these women, who, without any direction, had the presence of mind to recuse so many young and sick. in this good work they never thought of their own clothes and property, which has been consumed. many of the children were only partly dressed. The majority were shrouded in sheets and blankets; some sat nursing a little one on the green turf bordering the garden; others stood in groups observing the quick spread of the fire., while the elder ones assisted in removing the valuable furniture and clothing. The scene at this moment was extremely sad and affecting, the air was cold, and drizzling rain began to fall; the children looked sad and pale, while the ears many were shedding glittered with the reflected light of their burning home and school. Shortly afterwards, the sick, infants and girls, formed a sad procession, with their sheets around them, to the houses and stables of Mr. Overton, a neighbouring farmer, who very generously lent every possible help. The fire extended from the blanket store along the roof of the wing running westwards. This gradually fell, and ignited the floors and beds underneath; comparatively little flame was observed above the building which may probably account for the arrival of only one fire engine; but the interior of the rooms soon appeared one mass of fire and as beams, iron bedsteads, and slates came crashing down in quick succession, vast showers of sparks rose in the air and fell on the ground in front of the school. The fire ere long caught the roof of the wing conducting to the large south tower already mentioned as situated at the end of the central portion of the structure. At this juncture, about forty of fifty minutes from the first outbreak of the fire, workmen arrived from the small town of Sutton, situated about a mile from the school, and immediately afterwards the fire-engine from Carshalton, which is about two miles distant. Measures were taken at once to prevent the spread of the fire to the central portion of the building and north wing. Mr. Rouse, builder, with his men, and Mr. Ross, the school carpenter, cut through the roof of the infant school. 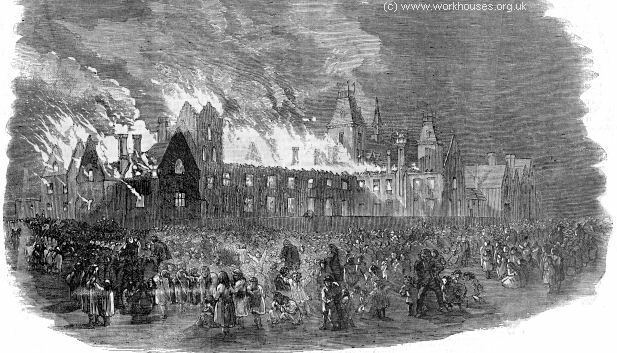 This, fortunately, is only one story high, but it connected the burning portion with the front apartments, which are united to the dining-hall in the centre. At the same time the doors and some of the floor were removed from near the south tower; the water at the top flooded the passages leading from the staircase, while the fire-engine, vigorously worked by the firemen and neighbours, played constantly on the adjoining apartments. by these means the fire was gradually subdued, and shortly afterwards there was little danger of its further extension. It smouldered among the debris and at the ends of the beams till evening. Thus only about one-third of the entire edifice was consumed. This portion embraced the girls' school and two class-rooms, the girls' day-room and needle-room containing many pinafores, shawls, and bonnets; the infants' school, day-room, and class-rooms, the private apartments of the teachers, girls and infants, with two stories above all of these rooms, used as dormitories by the children. A vast amount of furniture has been destroyed, more especially in the of the new south wing and in the needle-room. The bedding, however, of two large sleeping rooms was saved by the officers with companies of the elder boys and girls. The furniture of the front apartments was also removed into the grounds by the officers and servants and assembled neighbours, who rendered every assistance in their power. The building, but not the furniture, was insured. About eight o'clock in the morning the children returned to the school. From want of sufficient accommodation about 200 girls and infants have been returned to their Unions. The remainder are now all instructed by their respective teachers in the apartments in the north wing, which was before this calamity wholly occupied by the boys. The general working of the establishment now proceeds as usual. On Sunday the children assembled to celebrate Divine service, and especially to join the thanksgiving to Almighty God for the late merciful interposition of His providence in delivering them from peril. When we got out at the Sutton station, all eyes were directed to the schools on the hill. It did certainly look a magnificent place, and as I got up nearer to it, with my hand in Roberts', I admired it the more, and resolved to do the best I could there. A separate page contains the whole of W.H.R. 's story. 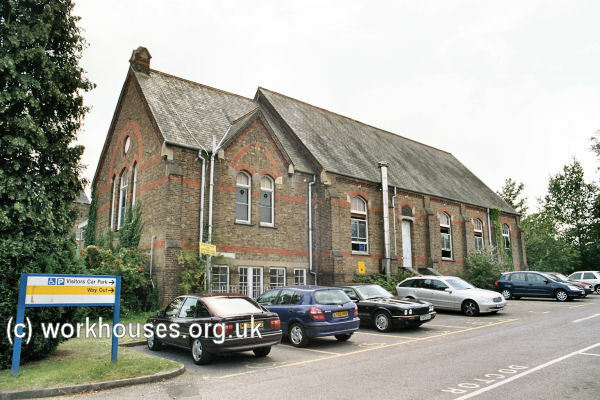 In 1873-4, a large new chapel was erected on the site which could accommodate a total of 1,318 children. In the 1870s or 1880s, a new school was erected at the south of the existing buildings. It had an E-shaped layout facing to the east. 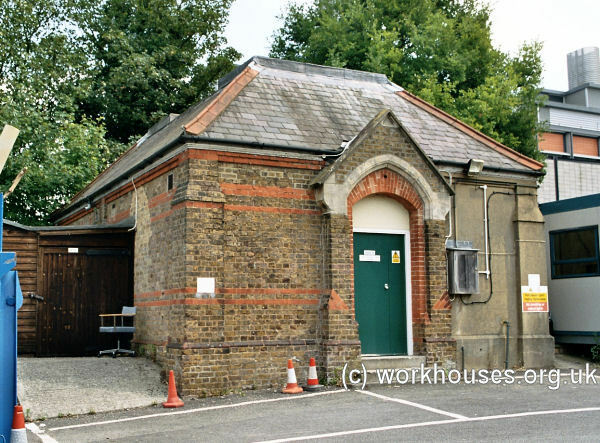 A smaller E-shaped building to the south and adjacent to Belmont station may have contained receiving or probationary accommodation for new arrivals. 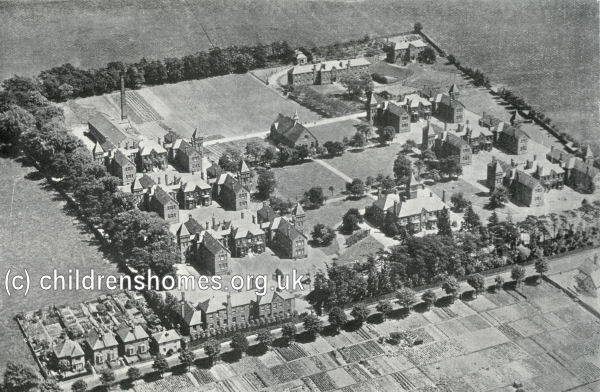 Belmont workhouse from the east, early 1900s. The site was sold to the Metropolitan Asylums Board in 1904 who used it to house imbeciles. 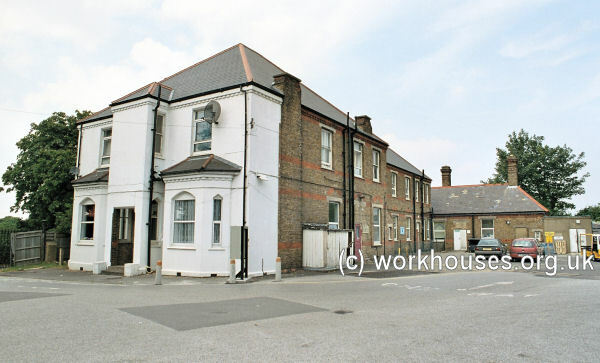 In 1908, the premises were leased from the MAB by Fulham Union and was known as Belmont workhouse. In 1916-19, the buildings served as a military hospital. The Brighton Road buildings later became Belmont Hospital, renamed the Henderson Hospital in 1958. The buildings have now been completely demolished and a housing estate occupies the site. 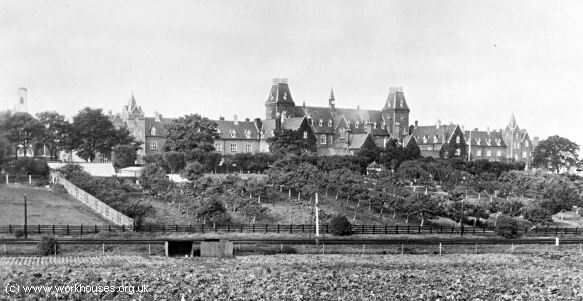 Belmont Hospital from the east, 1920s. One of the Sutton school's most famous inmates was Will Crooks who spent a period there in 1861. Crooks went on to become Chairman of the Poplar Board of Guardians, Labour MP for Woolwich, and Lord Mayor of London. He later recalled of Sutton, "every day spent in that school is burnt into my soul." 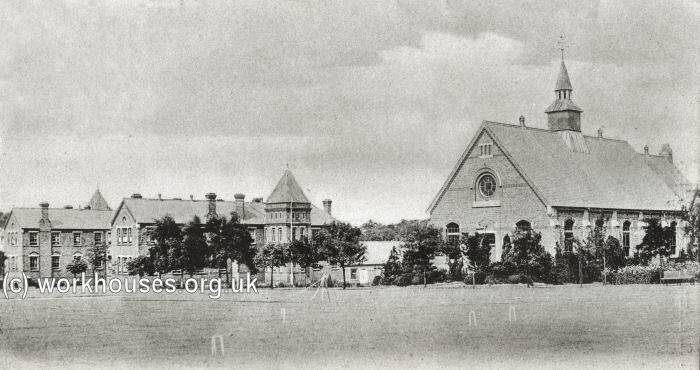 In 1882-3, pressure of increasing numbers resulted in the erection of a further new school complex at a nearby 19-acre site at the east side of Banstead Road. The new school, which cost £92,306, was based on a pavilion -block layout. It was originally intended to accommodate up to 400 infants. However, by the 1890s, it had become the girls's school, with the old site then being used for boys. In 1898, it accommodated up to 649 girls aged eight or over. The site layout is shown on the 1895 map below. The main children's accommodation was in six two-storey H-shaped blocks, three across the north side of the site and three across the south side. There were four main ground-floor rooms in each block used for dining, playing, reading and working rooms, plus offices etc. On the first floor were four large dormitories, each with 23 to 25 beds arranged in two rows, and two small dormitories used by girls being prepared for service. There were two lavatories on each floor, but apparently only two bathrooms in the entire institution supplemented by a very small swimming bath. Each block had its own kitchen and a detached laundry at the rear. The administrative block at the centre was a two-storey U-shaped building with a tower rising above. To the rear of the administration lay lawns divided by pathways leading to the chapel/hall. An L-shaped block at the north-west corner of the site was originally intended as a probationary ward for new arrivals. By the 1890s, it had been converted for use as the school's infirmary, with one large and two small dormitories, and a day-room. 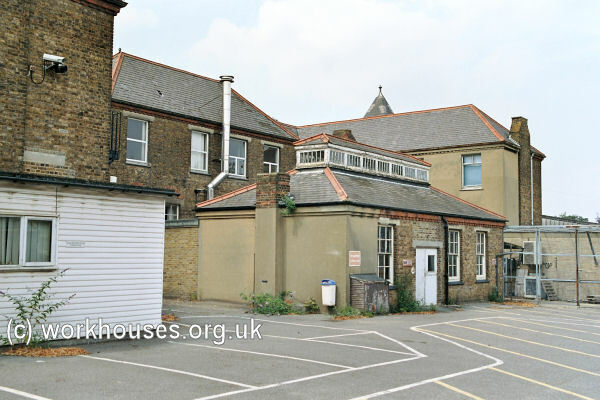 Two buildings at the south-west of the site which had originally been intended as the infirmary and isolation blocks had, by the 1890s, been converted for use as school-rooms. To the rear of the original infirmary was a small mortuary. As well the normal school routine, children were occasionally taken on outings to the Crystal Palace or Bognor Regis. 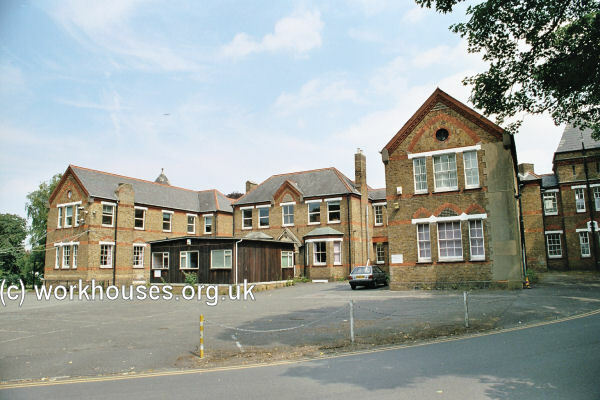 The Banstead Road site was purchased by the Metropolitan Asylums Board in 1902 and became the Downs Schools, used for the treatmnet of children with ringworm. In 1912, it was turned over for the treatment of TB patients and became known as the Downs Sanatorium, later known as the Downs Hospital. More recently, the site has been shared by the Royal Marsden and Sutton Hospitals and the Institute for Cancer Research. 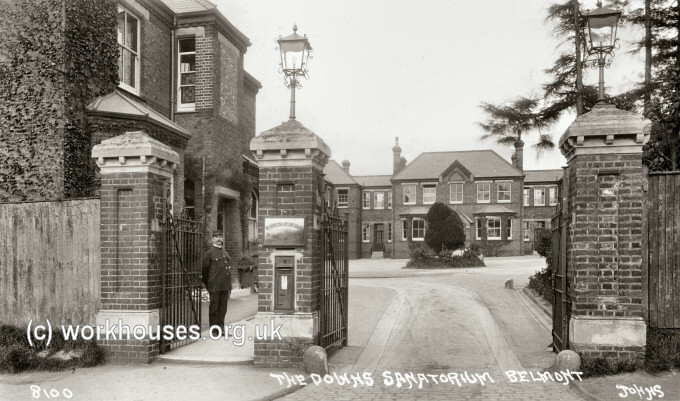 The Downs Sanatorium - main entrance, c.1913. In 2004, most of the buildings survived with the exception of administrative block which was demolished in the late 1990s. 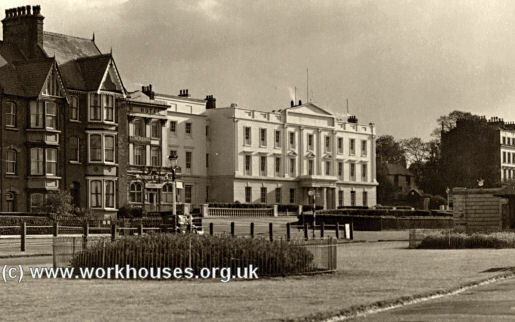 In July, 1876, the School District opened a children's seaside convalescent home at Herne Bay in Kent. The three-storey building on St George's Terrace, formerly the Pier Hotel, cost £4,383 and contained 170 beds. Not being built for the purpose, it was said to be poorly ventilated, and the ground floor dark and depressing. The school-rooms had to double up as recreation rooms and arrangements, particularly for washing, were unsatisfactory. 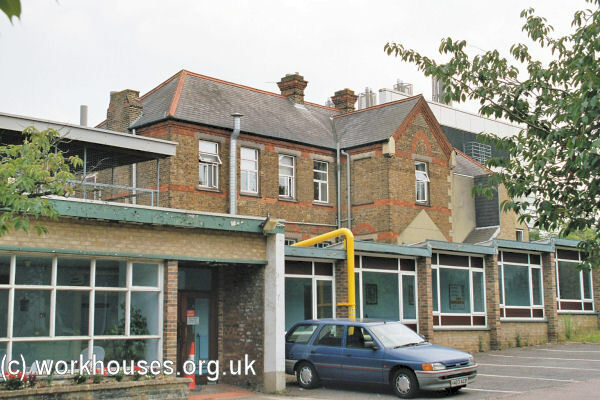 In 1897, the building was acquired by the Metropolitan Asylums Board for £17,000 and became known as St. Anne's Home. In 1919, it was converted into a TB Sanatorium. 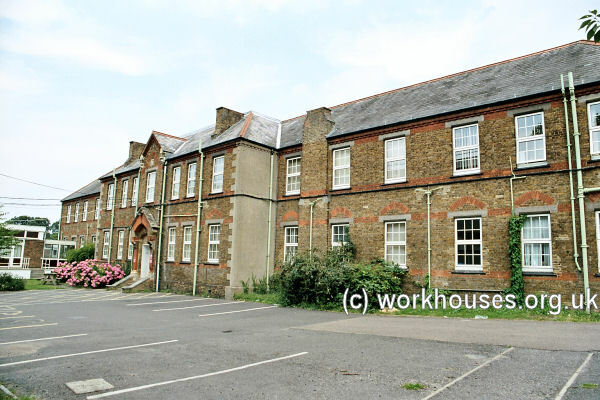 In 1882, the School District purchased the former Witham Union workhouse in Essex for use as an orphan home. Witham general view from the south-east, 2002. The building could accommodate 200 children and had 13 dormitories, five for boys and eight for girls, with an average of 18 beds in each. There were also five day-rooms, three for boys and two for girls. The boys' rooms intercommunicated, with one being used for reading, one for games, and the other as a general play-room. The girls' rooms were also interlinked, one being used as a reading room and the other as a play-room. A number of the boys cultivated their own small garden plots, but apparently the girls showed little interest in this activity. A new school-room block was erected in 1892. The South Metropolitan School District ceased operation in 1902. Minutes and reports of the Board of Management; Annual reports and accounts; Correspondence with Poor Law Board; Papers relating to building works and maintenance; Admission, discharge and creed registers for Brighton Road School, Banstead Road School, Witham School and Herne Bay School; Registers of apprentices and servants; staff records.